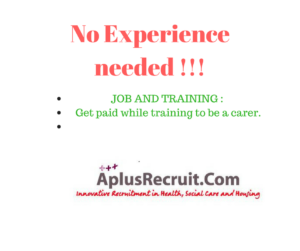 Care Assistant Jobs are easy to get since you need little or no experience. It does not require any special qualifications rather than passes in both numeracy and literacy, however it is always beneficial to have some previous experience whether paid or voluntary in any healthcare role. Voluntary experience can be gained from local charities, NHS or any other organization. Once you applied for a job you are required to pass a Medical Check-up or an health declaration. You will need to get a Disclosure and Barring Service DBS clearing. The DBS is a disclosure criminal background (but even if you have a criminal record you can still be considered for a care assistant job as this depends on the crime and the rehabilitation period and will be assess according to the rehabilitation of offenders act). Once you are cleared to commence work you will get on the job training where you work alongside professional while also building your career. Care Assistant jobs gives you the opportunity to become a driver. Someone holding a driver’s license is always a plus. Because sometimes you must travel from one place to the other it is quite efficient and effective to possess a driver’s license. Care assistants plays an important role in changing the lives of persons. Often times these patients are without families and friends to be their companion so these care assistants are the ones who are there with them 24/7 making them feel happy, lifting their spirits. Care Assistants are the heart of the sector they ensure that the patients are comfortable, the environment is clean and everything is up to date for the nurses and doctors to do their jobs. This job can be of help to persons who have kids because of the flexibility of the work hours, so you have time to spend with your own family.